This photo doesn't do the natural beauty of the Chandler Reach property justice. It is truly one of the great spots to try wine in the Pacific Northwest. One of the stunning places to taste wine in Washington, Chandler Reach is a gorgeous property located outside of Benton City, Washington in the Columbia Valley. The winery focuses on their estate grown fruit, and was started in 1997 on a trip to Italy where the owners saw opportunity on launching a winery between Richland and Prosser off I-82. Len Parris panned his vineyard in1999 with starts off from the famous Ciel du Cheval vineyard. 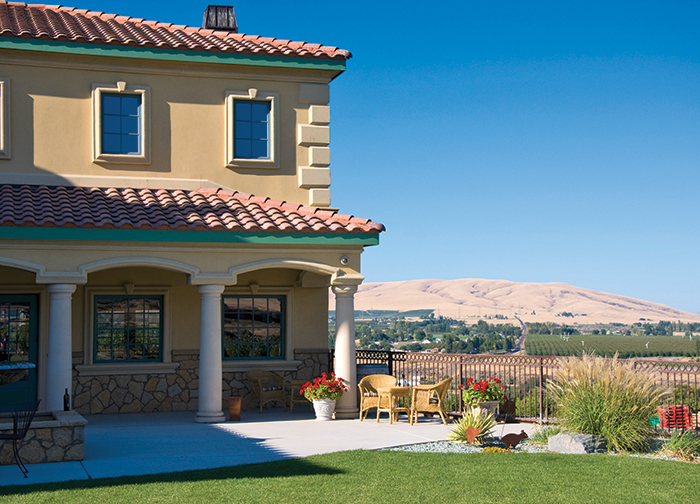 The Chandler Reach winery has a beautiful Tuscan style villa overlooking the valley and Yakima river. Having tasted there for more than a decade, this is one of the great Washington spots to go tasting in Eastern Washington. Most of their wines show impressive fruit and structure. They have received considerable recognition for their red wines, especially their Cabernet Franc and their Monte Regalo, a Cabernet blend. They have a very solid lineup of wines as many of their current releases have had extensive bottle time. Look to the 2012 Chandler Reach Syrah (WWB, 90) which has marvelous structure and ripeness. The best wine that I tried was their 2013 Chandler Reach ‘Perris Reserve’ Cabernet Sauvignon (WWB, 91) which has gorgeous dark fruit flavors and great tension. Check out more about Chandler Reach wines at http://www.chandlerreach.com/#estate-winery Here are the new releases by Chandler Reach.